President Isaias Afwerki received US Assistant Secretary for Africa, Tibor Nagy, to discuss bilateral and regional issues of mutual interest. 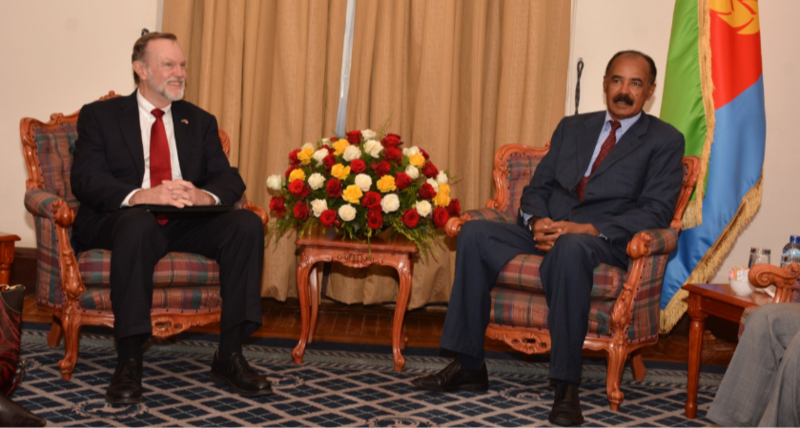 Ambassador Nagy reiterated US decision to strengthen its ties with Eritrea. Assistant Secretary of State for African Affairs, Tibor Nagy, today met and held his first ever talks with President Isaias Afwerki at the Denden Hall here in the capital Asmara. The meeting comes as part of his recent tour to Horn of Africa countries with a focus on promoting stronger trade and economic ties with the United States. During their meeting, both President Isaias and Ambassador Nagy discussed on bilateral as well as regional and global issues of interest to the two countries. 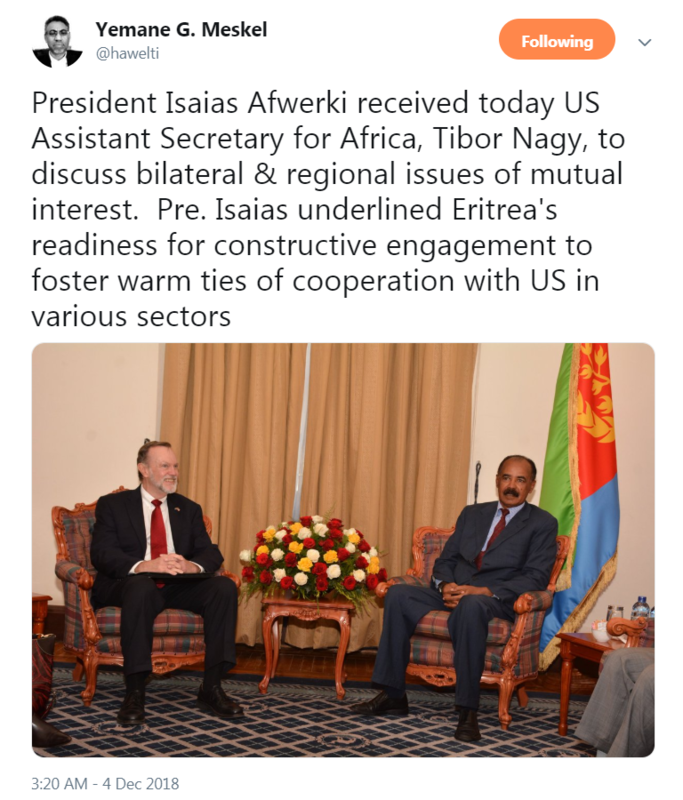 Relations between Washington and Asmara have long been frosty but Assistant Secretary of State Tibor Nagy told journalists ahead of this trip to Asmara that he hopes that will change. “We would like to have the same type of positive relations with Eritrea as we do with Ethiopia,” Nagy said during a visit to its capital Addis Ababa last week. Assistant Secretary Nagy on his part reiterated his country’s willingness to strengthen relations with Eritrea. Assistant Secretary Nagy also held similar discussions with Foreign Minister Osman Saleh and other senior Government and PFDJ officials. The Horn of Africa is in the midst of profound political change following the historic peace agreement between Eritrea and Ethiopia over the summer. 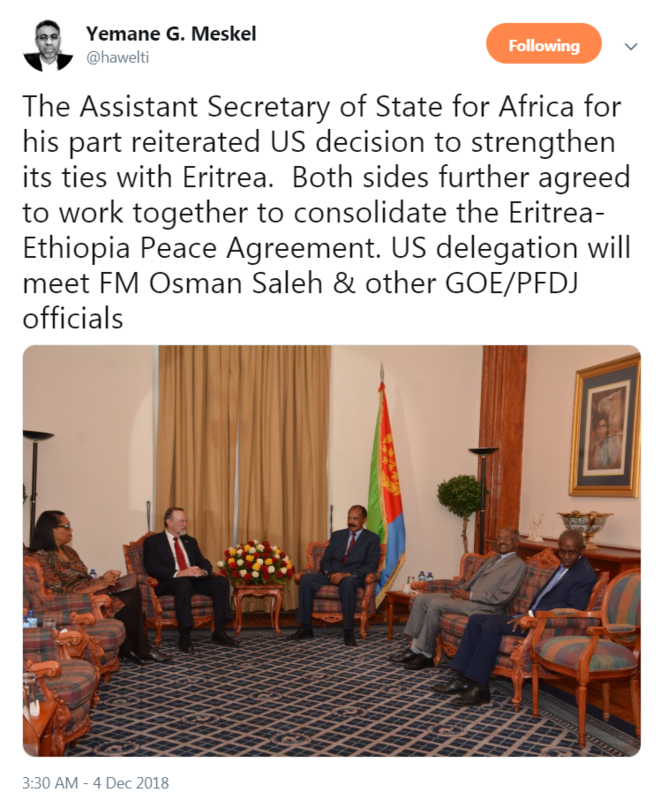 As a prelude to the new political and strategic realities in the region, the U.S. suddenly shift its long held anti-Eritrea policy, courtesy of national security adviser John Bolton, resulting in the lifting of the almost decade-old sanctions against Eritrea.